The quality of your daily life—the mood you’re in, your emotions, and your physical state of being can be centralized on one simple focus—the sleep you got the night before. This AmazonBasics Mattress Review, about the queen-size memory-foam mattress with 3 foam layers for optimal softness and support, can help you choose how to get your best rest. If you’re ready for an upgrade from lumpy spring-coil to foam luxury, the AmazonBasics Mattress is actually anything but basic. With its CertiPUR-US Foam and Oeko-Tex Certified high-quality performance, this mattress is not only supportive but also has been tested for harmful substances and is non-toxic. To help you see if this one is right for you, our AmazonBasics Mattress Review can help you know the ins and outs, before you buy. The features are what makes a mattress different and significantly better than one another. With its sleep cool characteristic, you’ll get a high-performance circulating airflow because of second layer breathable holes. The plush feel of the AmazonBasics Mattress also puts it over the top, with soft texture for quality sleep and adequate firmness and support for your body contours. 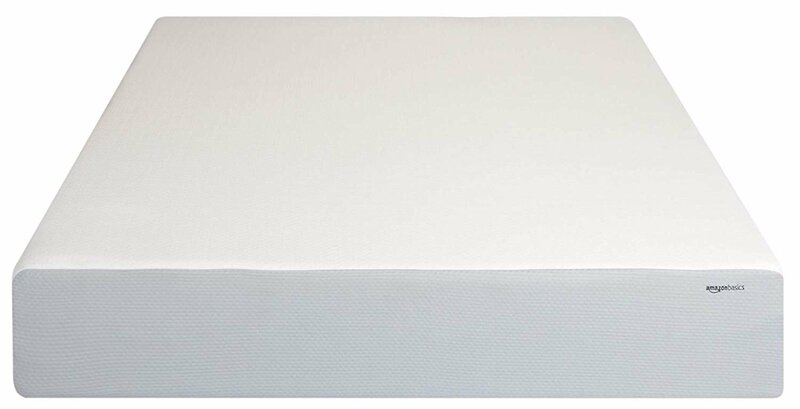 In this review, we’re going to go through the performance rating of each individual feature, from this mattress’ CertiPUR-US Certified foam and an Oeko-Tex Certified top fabric, to its 1-year limited warranty, we hope that this can help you make your decision. If you’re looking for high-quality performance in a mattress—meaning, which mattress can get you the best night’s sleep—layers designed with memory foam can go a long way. Especially if you have pains and aches throughout your body, the memory foam provides the contour to your body so it doesn’t push back—unless you want it to with the pressure points. With the AmazonBasics Mattress, the pressure points are accentuated in the hips and in the shoulders, which makes it perfect for slide sleepers. Although it might not be sturdy enough or supportive enough for those who are a bit on the heavier side—leading to possible sagging of the edges later one, this is a perfect mattress to fit into a guest room or for someone who is lighter than the average weight. For a cost-effective mattress that won’t break the bank, this mattress is not just great for children and guest rooms, it can clearly be chosen as a convenient choice for the mattress to fit your frame. Although the thick memory foam that comes along with this mattress might mess with the temperature regulation, it has its advantages—on of them being motion isolation. Whether you are sleeping with a partner or your dog or cat loves to pounce in your bed while you are already asleep, the motion isolation of the AmazonBasics Mattress can definitely help keep you from waking up in the middle of the night. If you think that the foam makes it extremely soft and not very supportive—the hard foams make up for it. Right at the base, the high-density gives you the support and bounce you’ve been looking for. The AmazonBasics Mattress comes with three different foam layers, the memory foam, the airflow soft foam, and the high-density foam. Although the mattress is not backed by the highest number of foam layers on the market in accordance with a mattress, it still is a pretty important feature when it comes to judging the firmness of the feel. The Comfort Layer: The first layer up, the memory foam, is not only changing to whatever you may need but is body-contouring to hug and develop pressure points in the parts of your body that you need it the most. The AmazonBasics Mattress is made with the comfort layer that is not only giving you valuable pressure but offering a much quicker response than other foams out there with the pressure. This also helps if you are a mover while you sleep. The Transition Layer: The polyfoam, high-density layer is not what you think it may be. Instead of super high-dense material, it is actually made with a series of holes that actually help with the airflow. Especially since most memory foams are known for trapping body heat, the aerated polyfoam layer can help keep your mattress cool, no matter how hot you or your environment is. A cooling factor in your mattress is extremely important for a comfortable sleep. Last but not least, The Foundation Layer: As for the base, this gives it the firmness you might be looking for. Especially if you are a bit on the heavier side, you might want to take note of this feature since it truly adds up to comfort and support. For a full 12 inches of thickness, this can mean a lot to a sleeper who is looking for support. On the higher end of thicknesses on the market, the AmazonBasics Mattress review is thick—thicker than most. The right mattresses are normally measured around an average of 10 to 12 inches of thickness, making this one right in that range. If you are a heavier person, 12 inches is the minimum of thickness that your mattress should be to get a comfortable night’s sleep. Another important factor in thickness is the location of your mattress. If you plan on placing your mattress directly on the floor, you’ll need to have a minimum of 12 inches, which is what the AmazonBasics Mattress gives you. Especially since the floor is harder than a platform or a box spring, you’ll need a thicker mattress to absorb all of those shocks. A thicker mattress also means less sagging, which can definitely keep the mattress up with quality as you move forward sleeping on it throughout the years. Noise is definitely another factor to deal with when talking about mattresses. Whether you plan on sleeping with a partner and moving about while they are sleeping and do not want to disturb him or her or if you are living in close-quarters with another person, the noise that emits from a mattress can make a huge difference. Memory foam usually eliminates the noise—or at least reduces it to a minimum. This is an extremely important feature to pay attention to. Especially if you are comparing the AmazonBasics Mattress with other memory foam mattresses out there, prepare for the other basics to be blown out of the water. This mattress simply does not sleep hot. With extra attention to care when it came to manufacturing, the improvement in the air flow is consistent with AmazonBasics. Especially since it uses memory foam in its build, it is surprisingly kept cool throughout the night. Who doesn’t love a mattress with a great validation claim? While normally the certificates of a mattress really aren’t a high-priority feature before you buy a mattress, knowing that the AmazonBasics Mattress has backed up all of its claims with approval, it just adds to the advantages and worth of this product. 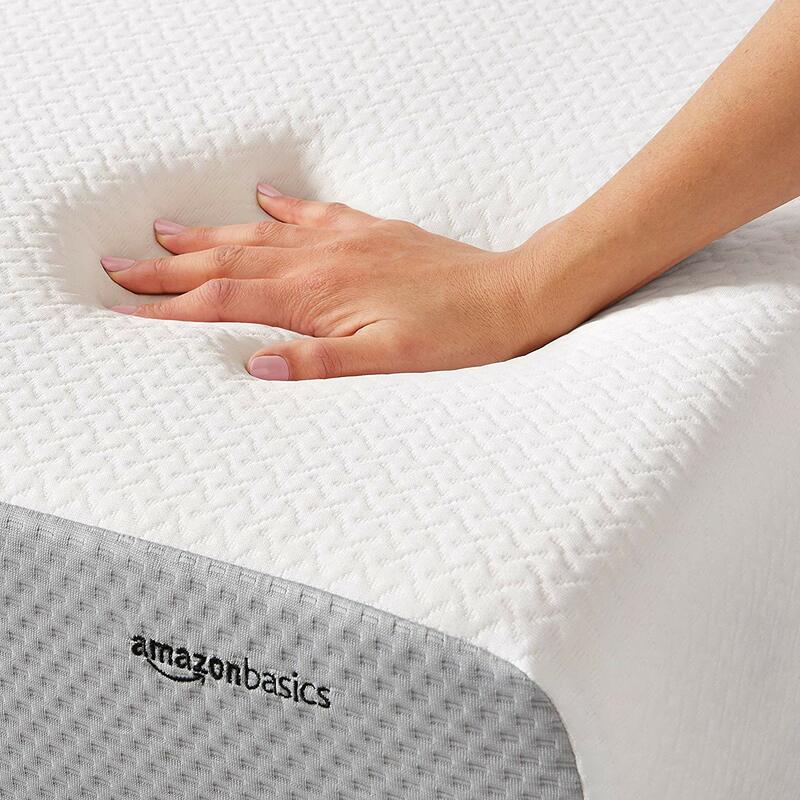 The AmazonBasics Mattress is not only designed with CertiPUR-US Approved Foam, but it is also made without ozone depleters, PBDEs, TDCPP, TCEP (“Tris”) flame retardants, mercury, lead, heavy metals, formaldehyde, phthalates, and is fully-regulated by the Consumer Product Safety Commission. For those of you who do not know or recognize what all of that means, it simply is stating that this mattress is the healthiest and most environmentally-friendly mattress that you can order and use. It also has low VOC (Volatile Organic Compound) emissions to help promote high indoor air quality, which is definitely something you should be looking for while you sleep. What good does it do if the insides are high quality but the cover of a mattress—the final layers—make it extremely difficult to sleep on? 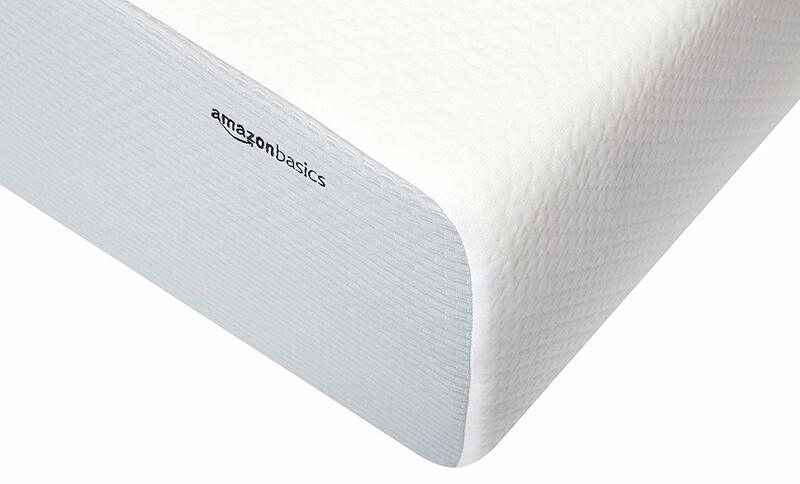 Well, with the AmazonBasics Mattress, you’ll have high-quality covers, all included with the price. The outer border and the bottom cover are made with one hundred percent polyester. The inner cover is a bit more inexpensive, designed with only 64.7% percent viscose and 35.3% glass fiber. These covers make a little rough and a little less durable than most other covers our there. However, this can be easily solved by using a fitted sheet on top, as well as the mattress protector. Another great feature of the cover of the AmazonBasics mattress is the fact that it is removable. In some cases, you’ll get a mattress where there is an irremovable cover that makes it difficult to clean and maintain. Not too many users have complained about the odor of the AmazonBasics mattress, which is really rather fortunate. The “new mattress smell” can actually be quite discouraging after opening up the package and rolling it out, only to be greeted with an unpleasant odor. If there is any new mattress smell, it goes shortly away after its first couple nights of being used. The inflation time is also another concern that some may have when purchasing a new mattress—especially if you want to use it the same day. The vacuum-sealed, pressed, and rolled AmazonBasics mattress makes it extremely easy to be shipped and delivered, however, the inflation time might normally be a concern. Not with this mattress! It is a quick inflation time, within a matter of a few minutes to a couple of hours, this guy is ready to go! This is where this mattress truly suffers. Most mattresses on the market come backed with at least a minimum of 10 years for a warranty or guarantee. Unfortunately, the AmazonBasics mattress only has a ONE year guarantee, which truly makes you think before buying this mattress. However, if you are trying to invest in a mattress for a guest room or a bedroom with a child, a 1-year guarantee isn’t necessarily a negative point. Another important aspect of this mattress is the sleep trial period—which is only set at 30 days. Most other sleep trials are minimum 45-90 days, which at least allows you to sleep on it and not only see the comfort level but to see if any pressing, physical problems develop. 30 days might simply not be enough. The price tag is definitely at the lower end of mattress buying, which may make you re-consider those last few points! The AmazonBasics Mattress has everything you need to get a high-quality night’s sleep, for a budgeted price. Although it is not truly backed by a very long warranty, this is the perfect choice for you if you’re looking for a budgeted mattress for a small bed or to make sure your guests in your guest room sleep with comfort. We hope that this review of the AmazonBasics Mattress has helped you make your buying decision.